Time travel has always been a popular subject for science fiction writers. From H G Wells’, The Time Machine, to Looper and Minority Report, the concept of being able to alter the future by making a small change in the past is a familiar theme. Wouldn’t it be great if you could go back and change a mistake you made in your earlier life, or see how your parents met or visit a historic moment in time? But, you need to be careful as travelling to the past brings the problem of a temporal paradox. Take Back to the Future, as an example. Marty travels back in time and, in one scene, prevents his parents from meeting. And if they don’t meet, how can he exist to go back in time? Another excellent film which covers a similar topic, is The Butterfly Effect. The central character has the ability to travel back in time to inhabit the body of his younger self, and make changes which alter the future. But, with unintended consequences. Travelling to the past would seem to be the easier concept to visualise, as recreating a historic scene can be based on archive photos or films. 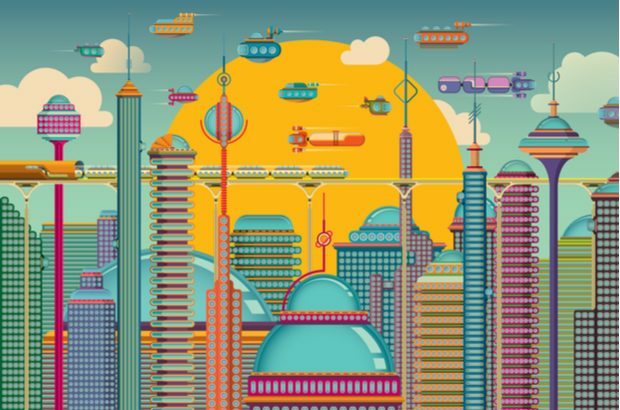 But, creating a futuristic city means trying to imagine or envisage what the world of tomorrow might look like and, to some extent, predict the future. It’s interesting to see how some films have got this right, and where others have not been so successful. Back to the Future was based in 1985 and took us 30 years into the future to 2015. There were flying cars, flat screen voice-operated televisions, self-drying clothing and hoverboards. Total Recall and I Robot both predicted automated cars, which are being trialled at the present. Stanley Kubrick's 2001: A Space Odyssey gave us the first example of a tablet computer. There's a scene in the 1968 classic, in which a pair of astronauts can be seen using tablet computers while eating breakfast. The iPad debuted in 2010, just 9 years after the setting of A Space Odyssey. Everyone these days has a smartphone which, to some extent, was predicted in the original Star Trek series with Captain Kirk’s use of the communicator; “Beam me up, Scotty” (the exact phrase was never actually spoken in any Star Trek television episode or film). The size will be determined by what’s convenient to hold, not by the technology inside. The box will have a high-res colour screen, a microphone, a plug for a headset or earphones, a camera lens, wireless connectivity, cellphone and beeper functions, a television and radio receiver, a digital recorder, and it will have enough processing power and memory to function as a desktop system. So, no flying cars, no time travel. But, the ability to change the future is possible, certainly within Companies House. Our transformation programme has started, but we need your help to tell us what you would like us to do. Our short survey will only take 10 minutes. Have your say on how you would like to see us evolve, what can we improve, what services would you like us to offer? By completing the survey, you have the opportunity to enter a draw to win a iPad Pro (as predicted in 2001; A Space Odyssey). Help us boldly go where no survey has been before.